Guest blogger Anthony P. Tizzano, MD, FACOG is on the clinical faculty of obstetrics and gynecology at Case Western Reserve University and Cleveland Clinic’s Lerner College of Medicine. In this blog post, Tizzano illustrates how Dr. Foster and others of his time had access to a growing collection of surgical instruments, driven by medical necessity brought about by the Civil War. Dr. Foster and others of his time had access to a growing and magnificent armamentarium of surgical instruments and innovations driven by medical necessity and growing demands on manufacturers brought about by America’s Civil War. Surgical instruments manufactured during the preseptic era, which finally came to a close around 1890, were nothing short of exceptional in terms of diversity and beauty. They exhibited standards of craftsmanship, fit, finish and overall artistry that were ultimately sacrificed in the manufacturing of later, aseptic instruments. 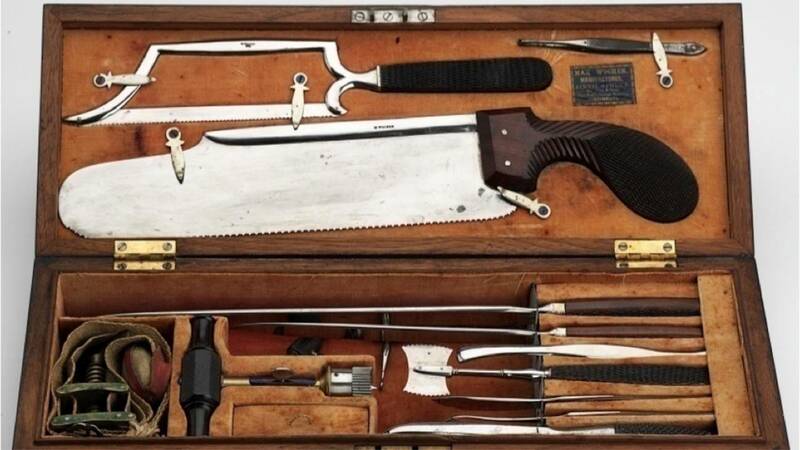 Surgical instruments of this earlier period frequently incorporated wonderful and rare materials in their design including, ebony, ivory, tortoise shell, agate, gold and silver. Most impressive were instruments that were destined for display at international exhibitions, as no expense was spared in their making with hopes for the most prestigious medals. Pictured below is a fine and rare example of an exhibition quality instrument, incorporating, polished steel, ivory and gold gilding, by the Parisian maker Charriere intended for amputation of the cervix. Over the course of the second half of the nineteenth century, the requisites for the advancement of surgery began to fall into place. Among these was the need for adequate anesthesia, antisepsis, and acceptable suture materials. With these key requisites in place, advances in surgical therapy were unparalleled in the entire realm of medicine. For more than two millennia, therapy was largely medical, and in less than half a century, it became surgical and spectacular. Young surgeons, the likes of Jedediah Foster, were at the cutting edge of this extraordinary time.